In 1917, Buffalo had awaited with keen interest the President's message which was read in Congress on April 2nd. It was generally anticipated that it would be a war message; most of the people, though not anxious, were ready for a declaration of hostilities. The young men especially had caught the enthusiasm of the hour, and the schools rang with patriotic songs and martial airs. 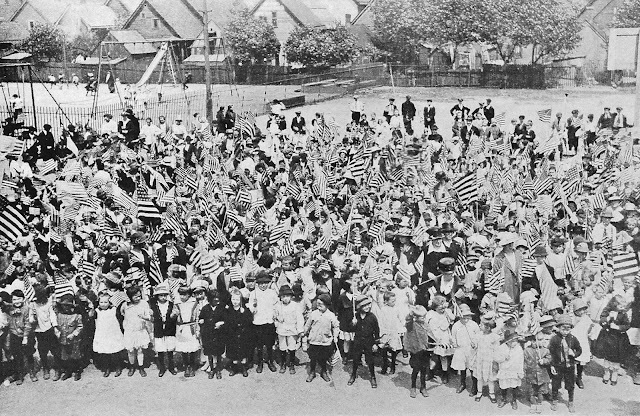 Promptly at 12 'clock noon on April 2nd, as Congress was called to order, upwards of 75,000 children and more than 3,000 teachers of the public and parochial schools assembled at their respective schools for patriotic exercises in recognition of the gravity of the situation with which Congress was about to deal. The program was simple. At exactly 12 o'clock the children sang "The Star Spangled Banner." The song concluded, they joined in rousing cheers for the President, for George Washington, Abraham Lincoln, Teddy Roosevelt, Mayor Fuhrmann, and everyone else who in their minds typified the American Government or American institutions. Appropriate resolutions were adopted, and the ceremonies concluded with the singing of "America"and a salute to the flag. President Wilsons war message to Congress, the patriotic fervor of the Elmwood Music Hall meeting, and the declaration of war itself served to set the blood of the people a-tingling and fill the city with martial airs. The month of April found bankers and merchants flinging the flag to the breeze. The practice quickly spread to the householders, if it did not originate there. 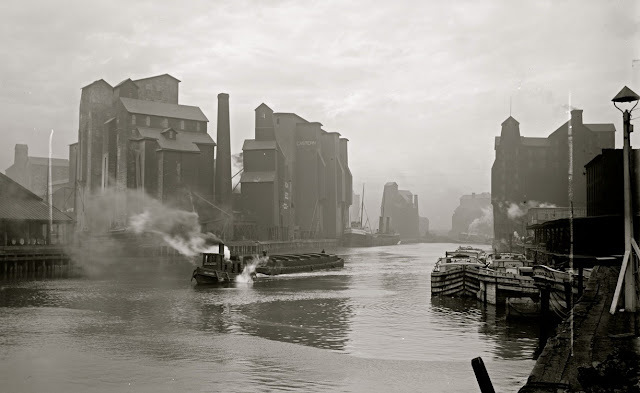 Large industrial plants added something akin to a renewal of allegiance by surrounding the flag raising events with ceremony and song. In many of the plants, workmen purchased and raised the flags themselves. Commissioners Malone and Kreinheder, Mayor Fuhrmann and other city officials were much in demand as speakers at flag raising ceremonies. Though the practice began in April it lasted through the entire year and at times the number was so large it seemed as though the city would burst out in one great American flag with the entire population cheering. The daily papers were filled with accounts of these jubilees. The first flags raised with ceremony were at the Pierce-Arrow plant in Elmwood Avenue, and at the Niagara Street branch of the Curtiss plant. Peter A. Porter, a former member of Congress, and Colonel Charles Clifton were the speakers at the first named ceremonial, while Mayor Fuhrmann delivered an address of patriotic character at the Curtiss plant. 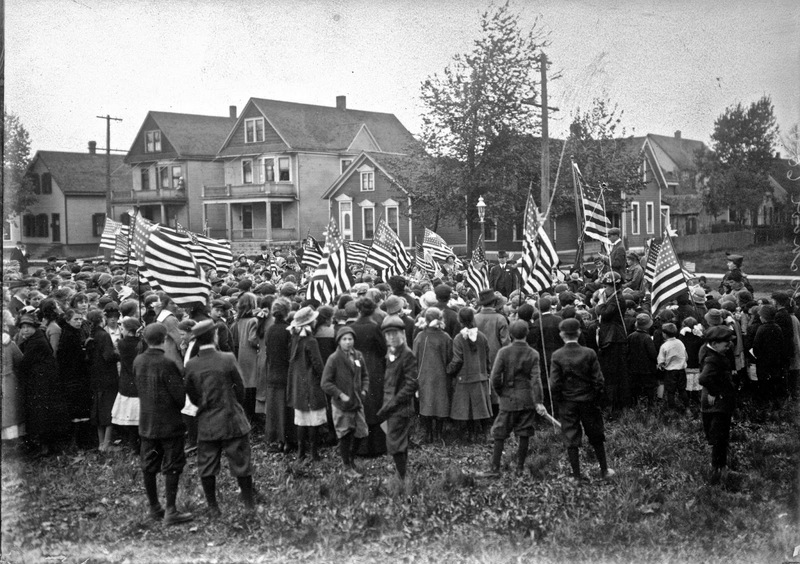 The following day, "Old Glory" was unfolded at the New York Central stockyards in East Buffalo, with Alfred D. Sears as master of ceremonies and Edward L. Jung as the speaker. A squad of fifteen members of the 74th Regiment participated in the observances and fired a salute to the flag. "I am an American. My father belongs to the Sons of the Revolution; my mother belongs to the Colonial Dames. One of my ancestors pitched tea overboard in Boston Harbor; another stood his ground with Warren; another hungered with Washington at Valley Forge. My fore-fathers were American in the making; they spoke in America's council halls; they died on her battlefields; they commanded her ships; they cleared her forests. Dawns reddened and paled. 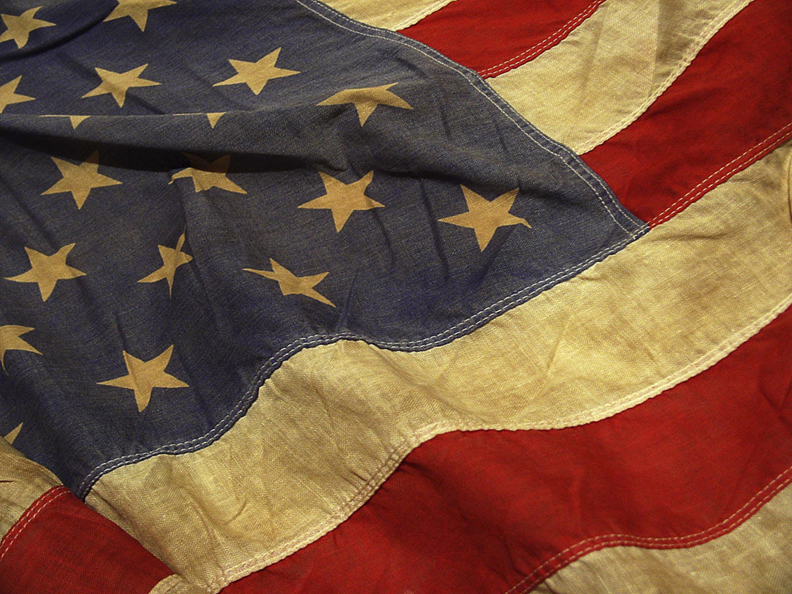 Staunch hearts of mine beat fast at each new star in the Nation's flag. Keen eyes of mine foresaw her greater glory; the sweep of her seas, the plenty of her plains, the man-hives in her billion-wired cities. Every drop of blood in me holds a heritage of patriotism. I am proud of my past. I am an American." "I am an American. My father was an atom of dust; my mother was a straw in the wind to His Serene Majesty. One of my ancestors died in the mines of Siberia; another was crippled for life by twenty blows of the knout; another was killed defending his home during the massacres. The history of my ancestors is a trail of blood to the palace gate of the Great White Czar. But then the dream came—the dream of America. In the light of Liberty's torch the atom of dust became a man and the straw in the wind became a woman for the first time. 'See.' said my father, pointing to the flag that fluttered near, 'That flag of stars and stripes is yours; it is the emblem of the promised land. It means, my son, the hope of humanity. Live for it, die for it'. Under the open sky of my new country I swore to do so; and every drop of blood in me will keep that vow. I am proud of my future. I am an American." 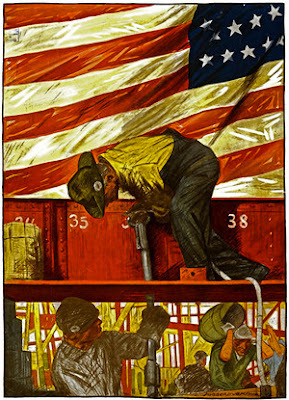 Flag-raising fever ran riot in those days and every factory and shop, every railroad and steamboat line, every club and church and society had its flag and its flag unfolding ceremony.